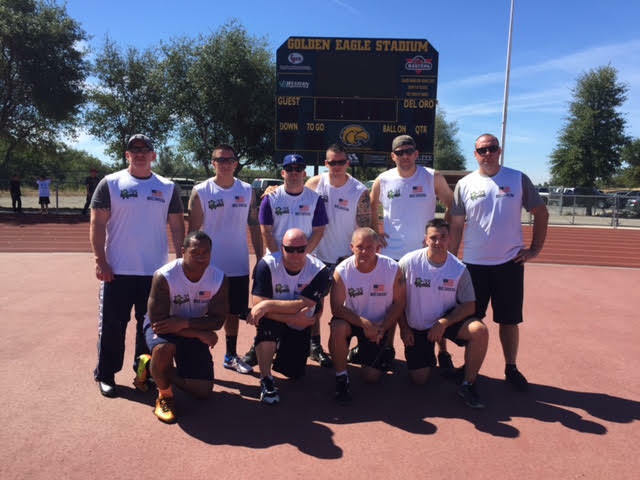 This past Saturday, officers from the El Dorado County Sheriff’s Office and the Probation Office, were invited to participate in the Detective Michael Davis Jr., Memorial Flag Football Tournament, hosted by the Placer County Law Enforcement Chaplaincy. This has been an annual event for the past five years. However, with the senseless killing this past October of Placer County Detective Davis and Sacramento County Sheriff’s Deputy Oliver, the Placer County Sheriff’s Office renamed this event. El Dorado County Law Enforcement Officers held their own in the four team tournament. They came from behind to almost win against the first Placer County team, falling behind in the last play of the game. They got it together in their second game, with a hurry up offense and a solid defense winning against the second Placer County team. Roseville Police Department’s offense was organized and difficult to read and was able to squeak out a win by only two points. El Dorado County represented very well considering they only had one practice and a very limited playbook. Needless to say, El Dorado County Law Enforcement Officers appreciated the opportunity to participate in such a worthy cause. Wait until next year….